for Adults (Parents, Tour Guides, Trainers, Performers, Writers, etc). for People in the Business World. for People interested in Tribal Cultures. and Prevention of (Emotional as well as Physical) Violence. 2018, Storytelling for Teaching, Training, and Healing (2-11 Feb 2018). 2017, Stories, and Storytelling Styles, from Many Lands (3-12 Feb 2017). 2016, Storytelling for Communication (5-14 Feb 2016). 2015, Storytelling for Teaching and Training (6-15 Feb 2015). 2014, Storytelling and Healing (7-9 Feb 2014). 2013, Teaching-and-Learning about Storytelling (1-3 Feb 2013). * Oct 2012 -- The participants are college students in Chennai, and Cairo (Egypt). Event notes are here, and the recording is here. * March 2013 -- The participants are college students in Chennai, and Kuala Lumpur (Malaysia). Students discuss their identities as expressed through their language use (sayings, proverbs, etc) and other cultural practices. The recording is here. * Oct 2013 -- The participants are high school students in Chennai, and Burlington, Wisconsin, USA. Students discuss their identities as expressed through their language use (sayings, proverbs, etc) and other cultural practices. Event notes are here, and the recording is here. Jan 2014 -- Videoconference Discussion about Storytelling and Healing. Info about, and a link to a recording of, this videoconference is here. March 2014 -- Videoconference Discussion about Dragons and other Monsters, on World Storytelling Day. Info about, and a link to a recording of, this videoconference is here. Feb 2015 -- Videoconference Discussion about Using Storytelling to Teach Languages. Info about, and a link to a recording of, this videoconference is here. * Talking about Videoconferencing (June 2007). 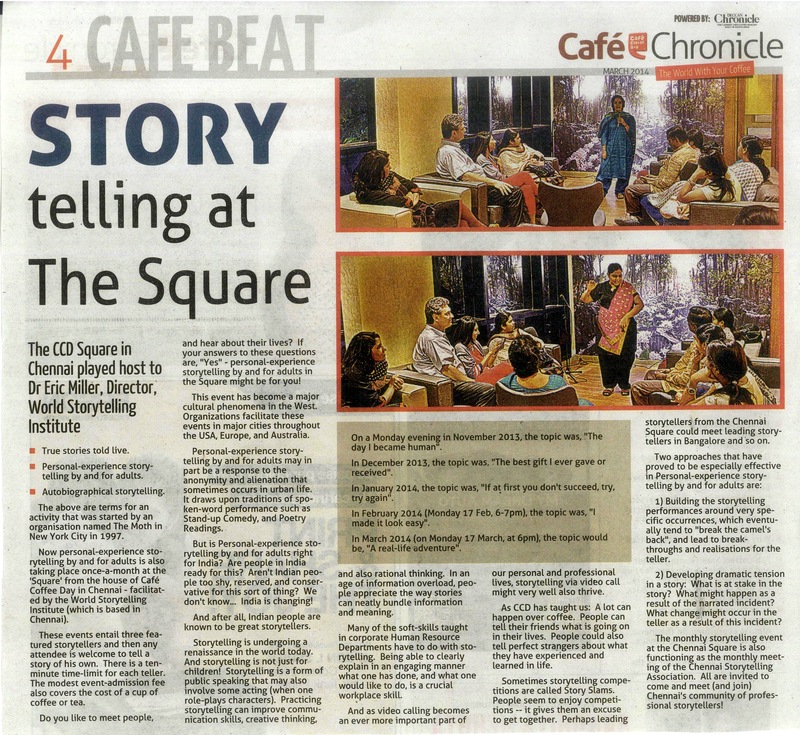 * Talking about Storytelling (Nov 2010). * Talking about Tribal People in India (Nov 2010). 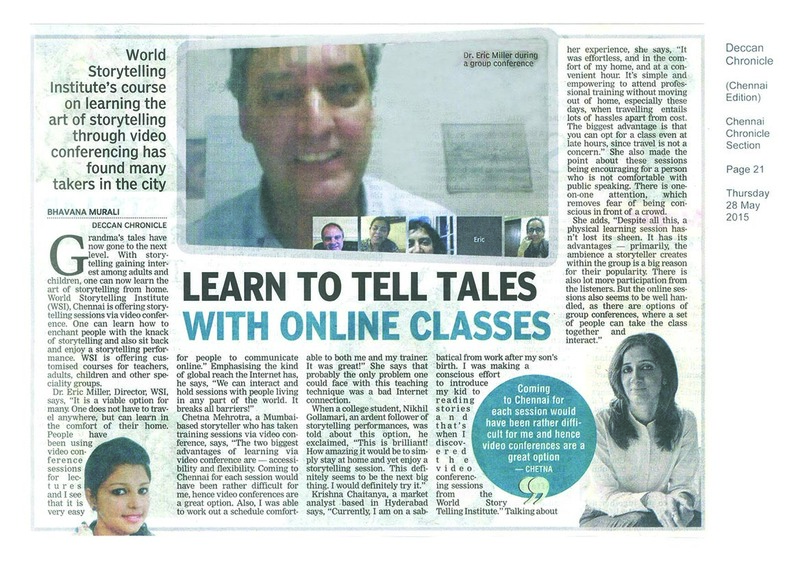 * "Learn to Tell Tales with Online Classes", Deccan Chronicle, Chennai Chronicle section, page 21 (21 May 2015). * "Storytelling via Interactive Video? ", Indian Express, City section, page 3 (19 May 2016). * "Videoconferencing at the University of Pennsylvania Update: Response to the 2002-7 Strategic Plan"
* "A Report on the 1996 Storytelling for the New Millennium Conference"
* "The 1999 Grammy Award Television Broadcast: Ritual Aspects of the Set Design"
* "A Mass-media Object in a Face-to-face Ritual: The Case of Television Sets in Restaurants and Bars"
* "Videoconferencing and the Teaching of Tamil Language and Verbal Arts"
* "Child’s Play, Language Teaching and Learning, and Videoconferencing"
* "The 16 Oct. 2004, and 15 Oct. 2005, Webcasted-videoconferences for the Demonstration and Discussion of Children's Tamil (and Other) Songs-dances-games, and Methods of Teaching and Learning Spoken Tamil Language"
* "Ideas for Cultural Videoconferencing in the Cairns Area (Northeastern Australia)"
* "Videoconference Interviews in the Folklore Classroom"
* "Ethnographic Videoconferencing, as Applied to Songs/Chants/Dances/Games of South Indian Children, and Language Learning"
* "Methods and Options for Videoconferencing in Relation to the Tamil Language in 2010"
* "Storytelling in the Age of Videoconferencing". The article as plain text is here. * "Ways Storytellers are Using Audio- and Videoconferencing for Training, Discussion, and Performance", introduced and edited by Dr Eric. * "12 Principles of Physically-present Storytelling"
* "Visuals Accompanying Physically-present Storytelling"
* "The In-performance Identification Process"
* "Turn-taking and Relevance in Conversation"
* "Roleplaying in an African Storytelling Event"
* "Continuity and Change in Chinese Storytelling"
* "The Performance of Epic"
* "The Performance of Epic and the Practice of Lament"
* "Textualization and Mediatization of Verbal Arts"
* "Verbal Play and Language Acquisition"
* "Program for a Tamil Language Learning Session: Singing-Games and Question-and-Answer Routines"
* "Storytelling Studies, and Subbu Arumugam's Villupattu (Bow Song)"
* "Theories of Story and Storytelling"
* "Weaving Magic: Storytelling in Chennai"
* "Using Storytelling to Facilitate Reading and Writing"
* "Storytelling and Story-listening, and Children's Intellectual, Emotional, and Social Development"
* "Are Fairy Tales Indigenous to India?" * "Aspects of the Storytelling Revival in India"
* "Storytelling between Husbands and Wives"
Four topics of stories a husband and wife -- or any people in a relationship -- might tell to, and discuss with, each other on a regular basis. * "Notes after the 2nd Session of a 3-session Workshop on Role-playing in Storytelling"
* "Dance, Movement, Gesture, and Posture in Storytelling"
* "Storytelling by and for Adults at a Café Coffee Day"
* "Ways Storytelling can be used for Teaching-and-Learning"
* "Ways Verbal Play such as Storytelling and Word-games Can Be Used for Teaching-and-learning Languages"
* "The Storytelling Scene in Chennai"
An Academic Discipline, or Interdisciplinary Field. · Courses In and/or About Storytelling (needs to be updated). · Storytelling Studies Bibliography (needs to be updated). * "Child Development, Arts Therapies, Education -- and Storytelling"
* "Expressive Arts Therapy -- including Storytelling Therapy -- in Cultural Context"
* "Becoming Oneself: A Goal in Carl Jung's Conception of Therapy"
* "Review of a Drama-and-Movement Therapy Workshop"
* "Story and Storytelling in Storytelling Therapy and Expressive Arts Therapy"
* "Fairytale Therapy: A Type of Storytelling Therapy"
* "Tamil Nadu's Silappathikaram (Epic of the Anklet): Ancient Story and Modern Identity"
* "Tamil Folklore Studies: The Contemporary Scene and its Background"
* "The Culture Area, South India"
* "Wireless Internet Access in Rural South India"
* "Thoughts about the New Delhi Symposium, Folklore, the Public Sphere, and Civil Society"
* "The Public Sphere, Folklore, and Interactive Telecommunication in Rural India"
* "The Asian Century of Folklore Scholarship: Reflections on the Chennai Conference"
* "Cultivating a Forest Language: Development Ideas for Kani Tribal People of Tamil Nadu's Kanniyakumari District" . "Invitation to a talk on Nature and Language"
* "Public Presentation of Folklore: Politics of Technology, Culture, and Discourse"
* "In Praise of Citizen Kannagi"
* "Kannagi: Global Symbol of Justice"
* "The Geography, Climate, History, and Culture of Tamil Nadu, South India"; and, "The Kani People: A Tribe of the Mountain Forest". 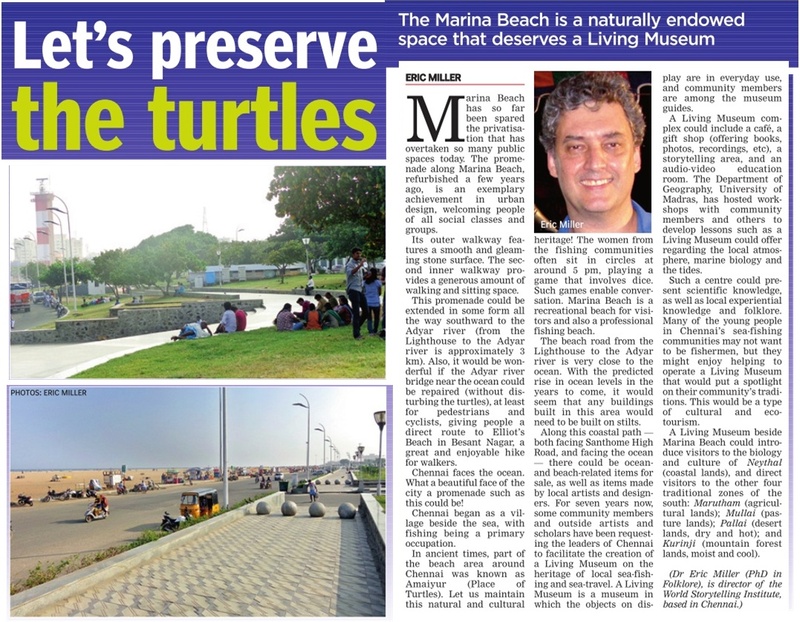 * "Marina Beach Deserves a Living Museum". The original, unedited version of the article as plain text is here. * "Variations in and of the Story of the Silappathikaram (the Epic of the Anklet)"
* "Why and How Has 'Habermas' Become a Household Word in the Social Sciences?" * "The Guardian-spirit Lady in the Experience of Edwin Pillay"
* "Festive Art in a Festive Neighborhood: Street Mosaics in New York City's East Village"
* "Live Video as Performance on New York City's Lower East Side in the 1980s"
* "Some Habitation Attitudes and Practices on New York City’s Lower East Side, 1982 to 2002"
* "A Folklorist's Report from Tamil Nadu, South India: Fieldwork, Public Folklore, Commercial Folklore-related Projects, and Teaching Folklore"
* "Sports -- Identity, Stories, and Images -- and the Boston Marathon"
* "The Value of the Multi-Discipline Approach to Research"